Delicious and healthy paratha made from a blend of healthy flours. 1. Mix all the flours, turmeric, salt, chillies, fenugreek and 1 tablespoon oil. 2. Add water a little at a time and make a dough, cover and leave for 30 minutes. 3. Divide the dough into 8 parts and roll a paratha approx 5mm thick and 6 inches in diameter out of each ball. 4. Heat a shallow pan and when it is hot place the rolled paratha on it, after 30 seconds flip the partha and spead a little oil on it, flip it gain and let the oiled underside cook. 5. Spread a little more oil on top side and flip to cook it. 6.Paratha is ready when brown spots appear on it. 7. Remove from pan and repeat for rest of dough. Serve with curry and some yoghurt raita. Event by Sameena of My Culinary Creations- Ragi Event. Ragi for breakfast event by Sanjeetha of Lite Bites hosted by Whats cooking . 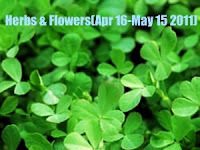 Cooking with Herbs and flowers Fenugreek- event by P.J hosted by Whats cooking. wow, that is a great trio of flours for paratha and of course all masalas must have made it yummy !!! Nutritious paratha simply looks fabulous..
Parathas look awesome. Great and healthy preparation. so nutritions and perfectly made parathas !! yummy and healthy....very nice recipe! This is a wonderful post...love raagi and these parathas are so wholesome and healthy. wow...this is healthy too.Adding wheat flour,chick pea flour and fenugreek makes it wholesome. Healthy and delicious parathas..Love this recipe! They look like thepla- wholesome n yummy recipe! Love this combination of flours. They look delicious. An awards waits for you at my place. Do drop by and collect it. love the healthy ragi paratha,looks yummy. That's a healthy bread to go for and nutritious too. Delicious and healthy looking parathas..nice recipe..thanks for sharing! My aunt makes them...missing it... very healthy one! These Ragi Paratha look great. I used to get Ragi when we ran a yoga retreat in Goa, but now back in the Uk it's pretty hard to find. What a shame! Apparently it's good food for strength building. They always used to say to me in India that the farmers eat a lot of ragi. Does it go under any different names if I try to look for it in an Indian supermarket? Great recipe - and would be easy to convert to glutenfree too.